Jamell Blue was shot three times during a robbery attempt in south Chicago during his freshman year of high school in 2006. He was walking home from school when he found himself in the wrong place at the wrong time. 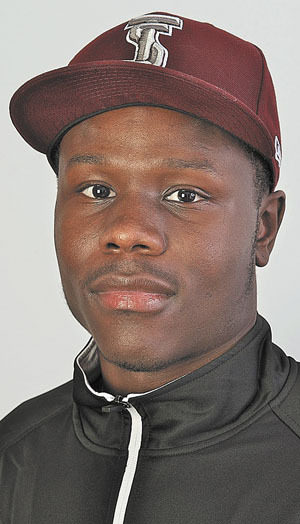 The senior southpaw pitcher for Texas Southern University said that bullets pierced his jaw, right hand and forearm while one bullet came to rest centimeters from his spine. Surgery was performed on his jaw and hand. But the bullet near his spine could not be operated on for fear of paralyzing him. He will carry this bullet with him the rest of his life. Jamell ultimately made a full recovery. The streets of Chicago feature some of the highest crime rates in the nation. According to 2014 Chicago crime and murder stats, there were 388 people shot and killed, 2,231 shot and wounded, 2,619 shot and 456 homicides. Chicago can be a tough place to live especially in south Chicago where Jamell grew up. “I was shot three times by a robber — once in the jaw, once in the hand and once in the back coming home from school,” said Blue. “I was just walking home, and another guy was walking by me in a dead end area which was dark. It was only me and the other guy who then tried to rob me. I didn’t have anything to give him. But I had already seen his face, and he then shot me three times. Blue said surgery was performed to extract the bullet and damage to his jaw as well as his right hand. To read more about the amazing story of Jamell Blue, purchase the April 3, 2015 edition of Collegiate Baseball or subscribe by CLICKING HERE. 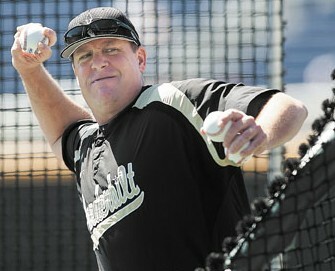 Vanderbilt hitting coach Travis Jewett is one of the elite coaches in baseball. He is now in his 22nd year as a collegiate coach and has been a big reason why the Commodores are 122-37 over the last 2 1/2 seasons and won the national championship in 2014. His hitters are extremely disciplined at the plate as attested to 671 walks over the last 2 1/2 years (4.2 walks per game) as his batters have a .408 on-base percentage. They also refuse to give in to inside pitches as hitters have been plunked 191 times during that time. His guys can also hit. Batters have collected 313 doubles over the last 2 1/2 years. This season his batters have hit .314 with 64 extra base hits in 21 games (42 doubles, 12 triples and 10 homers). They also have tremendous speed with 302 stolen bases in 2 1/2 years. Jewett not only utilizes a highly aggressive approach to hitting which produces results. But his teaching style is unique with a bubbly personality that everyone embraces. Plus, he is creative and utilizes every trick in the book to give his hitters daily game-like experiences when they hit. He doesn’t utilize gimmicks and is old school with his approach to hitting. He is absolutely convinced that for hitters to improve, they must see balls moving toward them just like in a game. Practices include the use of a special pitching machine which allows coaches to utilize eight programs and eight different pitches, if necessary, in different sequences to simulate pitchers they will go against. He also places a practice home plate at 55 feet from the machine, another 2-3 feet closer and a third 2-3 feet closer still. Then hitters can simulate faster pitches that go higher in the strike zone as they work on hit and runs which they must swing at. If that wasn’t enough, Jewett and other coaches throw hitters hundreds of pitches a day to prepare them for games. An in-depth explanation of the Vanderbilt hitting system will be covered. Jewett said that his hitters focus on success rather than the numerous failures hitters continually experience. “If we can do that, we can stay sane as hitters since batters have a high failure rate,” said Jewett. “I want them to be in control. I am a little bit of a cave man when it comes to the teaching of hitting. The tee and all those things are fine. But I would rather our kids warm up on things like this. “There is a difference between hitting and swinging. Hitting is having balls moving toward you with some speed and movement and utilizing strike zone management and recognition of breaking balls and shapes. “Every day, I want balls moving at our hitters. When you see the breaking ball shape, is it a ball, strike, up, down, a pitch I want to attack or more of a pitcher’s breaking ball that we want to check off from. To read more of this in-depth story, purchase the April 3, 2015 edition of Collegiate Baseball by CLICKING HERE. Jewett delves into the visual element of hitting, applying relentless pressure on opponents offensively, why discipline at the plate is crucial, teaching aggressive hitting, why you should never “stay back” when hitting and the problems this causes, why the natural turn of the lead foot is vital, plus much, much more.